iPhone Spy Software - Child Monitoring and Employee Monitoring! iPhone Spy Software – An Innovation in Child Monitoring and Employee Monitoring! If you have been devastatingly looking for a monitoring application for your children or employees, you need StealthGenie. I’m recommending because it works and works just right! StealthGenie is an easy-to-install, user-friendly monitoring application, that gives you many benefits and exciting features at an affordable cost. You can easily install it following the instructions emailed to you after you sign up. StealthGenie is compatible with iPhones – across all popular and most widely used versions. Read all SMS and e-mails. View call history with caller’s details. Access target’s saved contacts within the phone. Trigger alerts for words [or phrases] for SMS and emails. Receive Instant alert via email or SMS on SIM change notification. Track your kids via GPS and view location history. Having the power, the ability to be able to view your target’s phone data and even know where there are they present in terms of finding the accurate location and all that remotely makes an iPhone spy software – particularly, StealthGenie spy all the more favorable. For those of who you hold fears about such spy applications should particularly pay attention to this aspect – these applications are very safe and secure, above all, discreet. Your targets can never find out if you are watching them and can continue keeping an eye on them with complete satisfaction. However, relying on just any iPhone spy software is not a smart move. There are many scammers selling fake products online, for FREE! Never fall for apps that ask for no money in return. You never know they might use your provided information and trap you in unwanted scams. Other than that, some applications cost a lot. Beware of them as well. Not to mention the features provided might not be as good as they claim. Nevertheless, always choose an application that supports your target’s phone appropriately. 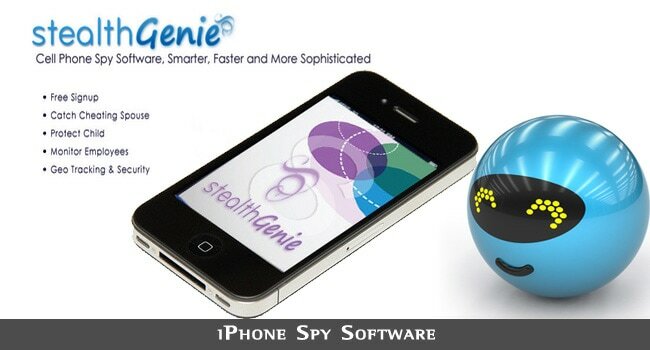 StealthGenie iPhone spy is an excellent means to monitor your kids and track your employees, on the go. You can even check out the website for further details. They have made some major changes in their software. Stealthgenie can now track WhatsApp messages for iPhone. Theonespy gives more proficient use of its iPhone, Android, Blackberry monitoring app for kids, teens, employee and spouse. I think stealth Genie is dead now. I opened but page not found. Its really helpful indeed.